Driftwood Theatre’s Play in a Pub returns for a second year! The stars of Stratford, Soulpepper and the Toronto stage come together in a pub very, very nearby for an evening of theatrical and cinematic mash-up of Shakespearean proportions in support of Driftwood Theatre! 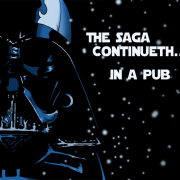 Building on the sold-out success of last year’s Play in a Pub: William Shakespeare’s Star Wars, Driftwood Theatre reunites some of the finest performers of the stage for another epic reading! GET IN ON THE ACTION by participating in the Play in a Pub Live Auction, and bid on one of three walk-on character tracks – rebels, imperials, or droid n’ creatures. GET A GREAT DEAL on some swank merchandise with a rebel-worthy selection of boutique baskets during our Market Auction. Grab your lightsabers and a pint and join Driftwood Theatre for an evening that is certain to be out of this world. Readers confirmed so far include: Canadian theatre legend R.H. Thomson (Obi Wan Kenobi), Soulpepper founding member Michael Hanrahan (Darth Vader), Michael Therriault (C3P0), Sarah Wilson (Princess Leia), Peter van Gestel (Luke Skywalker), Steven Gallagher (Boba Fett), Richard Alan Campbell (Chorus), Karl Ang (Lando Calrissian), Melissa D’Agostino (R2D2), Helen King (Chewbacca), Jacquelyn Pijper (Ugnaught #1) and, recreating all sound and music cues using only his voice, Steven Burley. Tickets: $25, on sale NOW. Click here or by phone at 647-381-6537. A service charge will apply to all orders. Tickets are limited, so book early! Book online and ‘share’ or ‘tweet’ about Play in a Pub for a 10% discount on your tickets!